A selection of sampler sized servings of a range of dishes, resulting in a three course meal. 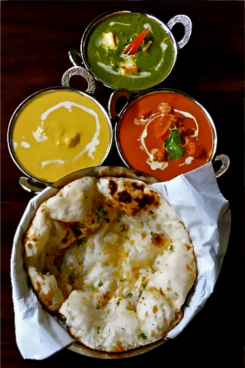 We offer a selection of our most popular dishes including sabji, roti, rice, pickles, papodams & raita, presented on an authentic THALI platter. Tender chicken breasts stuffed with paneer, cashew nut and chicken mince.Served with a rich cashew nut and cream sauce.